Lively, colourful, multicultural and fun, Kreuzberg is one of my favourite parts of Berlin, and I'm definitely not alone in that sentiment. One of the starring features of this city district is the Landwehr Canal, which cuts through the middle of Kreuzberg while heading westward from its source at the Spree River. Once upon a time, this canal was an important industrial shipping route, but today, all along the embankment is where some of the best leisure spots in Kreuzberg lie: markets, beer gardens, parks, cafes and picnic spots. Spending a few sunny hours strolling and exploring along these banks is one of the nicest Berlin afternoons I can think of. Image by Tim Lucas via CC BY 2.0 licence. As far as I'm concerned, there are two ways to enjoy the canal: the active way, on foot, or the lazy way, parked on your bum in a comfortable spot, cool drink in hand. 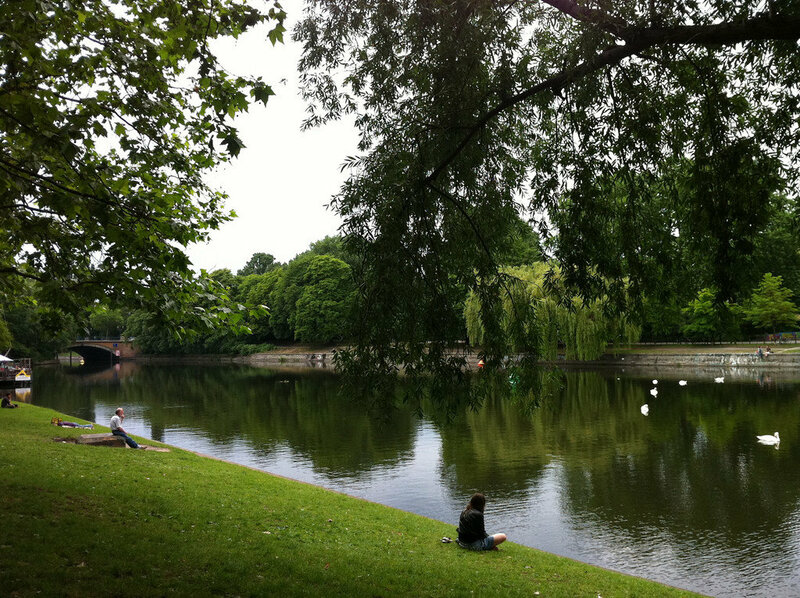 To partake in the former, either start at the Kottbusser Bridge and head west for a short stroll along the southern embankment, where willow trees drape into the water and gaggles of swans preen on the grass. 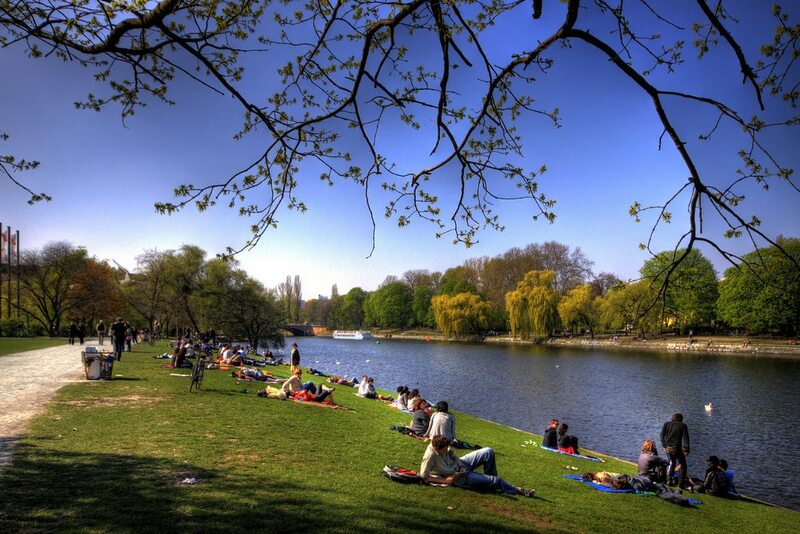 For the full Landwehr Canal experience, however, start instead at the bottom of Görlitzer Park and simply follow the course of the water. 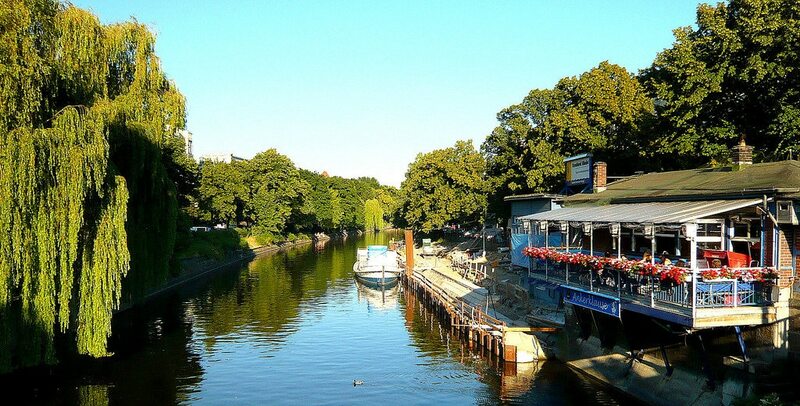 After just a few minutes, where the canal widens into a triangle at the junction of the Kreuzberg, Neukölln and Treptow districts, you'll pass the Jockel Biergarten (Ratiborstr. 14c), where you could be forgiven for stopping for a quick pint in the sun. Or head to nearby Five Elephant café (Reichenberger Str. 101), where you can pick up a to-go cappuccino made with excellent coffee beans roasted in house. Image by Andreas Lehner via CC BY 2.0 licence. Stay on this side of the water to do some people-watching at the popular public boules court. The benches around here are a beloved neighbourhood hangout spot, and many people even scamper down the slope right to the edge of the water to bask in the sun. Heading further west, cross over the bridge at Ohlauer Strasse. Several days a week there's a bustling market on the Maybachufer embankment here; Tuesdays and Fridays bring the so-called 'Turkish market' with vendors selling lots of fresh produce and Mediterranean delights, while every Saturday is a craft market selling fabric, homemade clothing and designs, and arts and crafts. 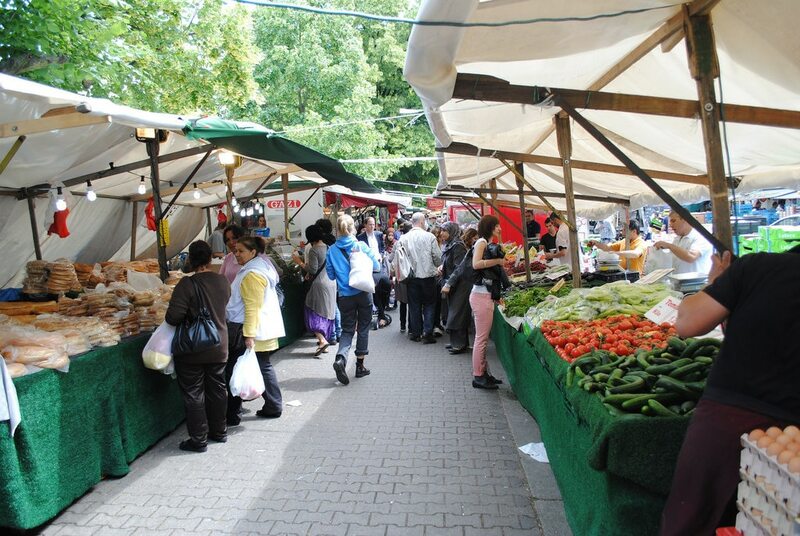 From late spring until early fall, there's also the Nowkölln Flowmarkt taking place here every other Sunday, a flea market with plenty of good bargains to be had, as well as food trucks and live entertainment. Image by Oh-Berlin.com via CC BY 2.0 licence. If you'd rather skip the walking bit and head straight for a comfortable spot to lounge, the Ankerklause bar right beside Kottbusser Bridge is in a prime spot (Kottbusser Damm 104). 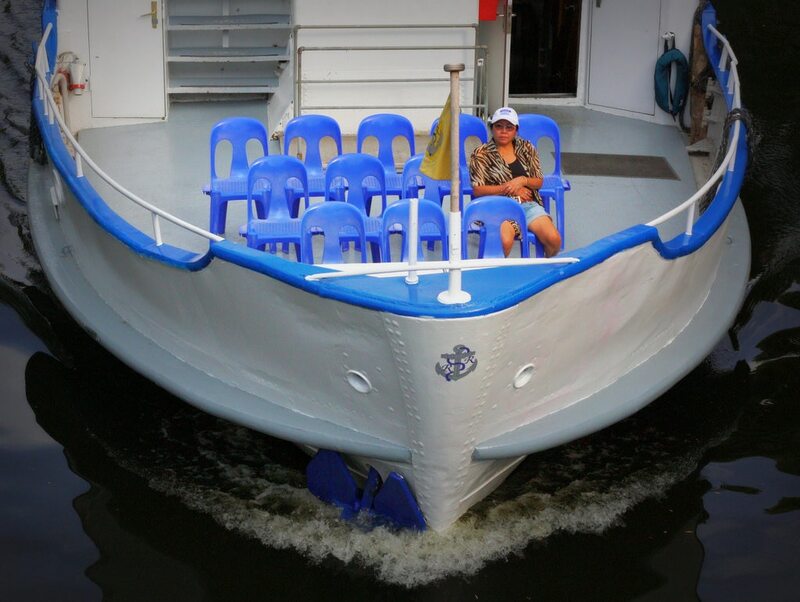 Grab a table overlooking the water, indulge in some nachos and beer, and wave at the tour boats bobbing by. For something more upscale, try Café Jacques (Maybachufer 14). It's the best restaurant along the canal, hands down, so getting a table could be a matter of luck, but the delicious French-Mediterranean seafood and pastas here are worth going through the effort. Image by Jenny Poole via CC BY 2.0 licence. If it's a sunny afternoon, then it's guaranteed that the grassy embankment known as Urbanhafen, about 600 metres further along the water, is the place to be. Head there to mingle with the locals and join the party, stopping at a shop along the way to pick up some drinks and snacks. In the summer, this spot stays popular well into the night, and some industrious types even make a business out of it, bringing along trolleys of beer and selling it by the bottle. If you'd rather have a proper seat instead of just a patch of grass, keep walking another 500 metres to Brachvogel (Carl-Herz-Ufer 34). Restaurant, beer garden and mini-golf course in one, it's the kind of place where the hours can just melt pleasantly away. Image by Uli Herrmann via CC BY-SA 2.0 licence. Ready to discover the joys of the Landwehr Canal? Check out our Berlin hotel deals to book your trip!